You will see the old capital of Kingdom Siam. Visit beautiful ancient temples: Wat Yai Chai Mongkol, Wat Mahathat, Wat Phra Sri Sanphet, Wat Chai Wattanaram. Local lunch and shopping for some souvenirs at Ayothaya Floating Market! 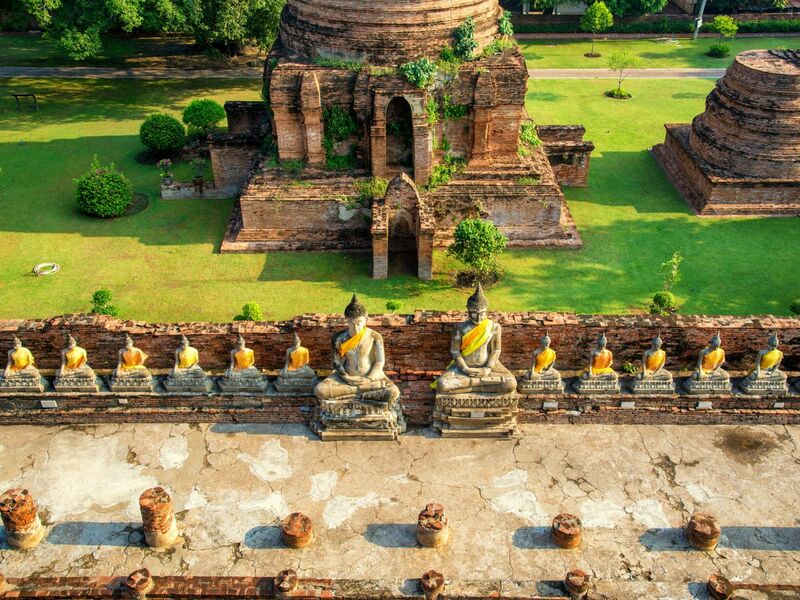 Arrive Ayutthaya and the first temple we will visit "Wat Yai Chai Mongkol". It was renovated after King Naresuan get victory from the war. Go to the second temple "Wat Mahathat". To see the highlight: the Head of the Buddha, with tree trunk and roots growing around it. Lunch time! We will have local lunch and shopping for some souvenirs at Ayothaya Floating Market. Visit the third temple "Wat Phra Sri Sanphet". This temple has no buddhist monks. The purpose is for the important ceremonies of the King and keep the bones of the King. The last temple is "Wat Chai Wattanaram" It's a very beautiful temple and good view for photos. Approximate time to arrive in Bangkok (depend on the traffic). All the temples have a history and Floating market copies the model form of old Kingdom Siam culture. All place is popular locations. Traveling with a toddler can have its challenges but our guides were very accommodating. Also they helped us order a great lunch. When we had to alter the itinerary because of the baby, the guides were kind and understanding. Their English was great and we would definitely book them with another tour when we come back! Khongkha and his assistant Pla were wonderful guides. The drive was smooth. The temples were beautiful! We liked how they made it a point to show us the beautifully crafted temple models before going in so that we'd have a sense of what were were looking at. Inside they kept us informed of what we were seeing and explained where the designs came from, what happened to them and and what the significance of them were. The guide was very friendly and accommodating. They made sure we were hydrated and helped us take amazing photos! the temples were breathtaking and king and his sister s were very friendly and knowledgeable. i would recommend skipping the floating market show for those with limited time.